The economic impacts of existing agreements between EU Member States and neighbouring countries. A simulation of various scenarios covering free trade in goods between the EU and some of its neighbours is attempted. 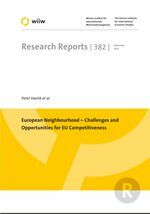 Conclusions are drawn and policy recommendations made on the basis of the analysis; these cover the challenges and opportunities for the competitiveness of EU enterprises and sectors in the neighbouring countries.